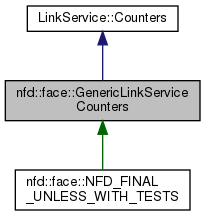 The type name 'GenericLinkServiceCounters' is implementation detail. Use 'GenericLinkService::Counters' in public API. Definition at line 41 of file generic-link-service.hpp. Definition at line 46 of file generic-link-service.hpp. If this counter is non-zero, the operator should enable fragmentation. Definition at line 52 of file generic-link-service.hpp. Definition at line 56 of file generic-link-service.hpp. Definition at line 60 of file generic-link-service.hpp. Definition at line 64 of file generic-link-service.hpp. Definition at line 68 of file generic-link-service.hpp. Definition at line 72 of file generic-link-service.hpp. Definition at line 77 of file generic-link-service.hpp. Definition at line 82 of file generic-link-service.hpp. Definition at line 86 of file generic-link-service.hpp.